The Norwegian Getaway has over 20 different dining venues for its 4,000 guests. These diverse options include a wide range of cuisines and ambiances to suit everyone's tastes. Many of the venues will be familiar, like the main restaurants and the large buffet on the pool deck. Others, like the Geoffrey Zakarian seafood restaurant, are new to cruise travelers. One nice feature is the number of restaurants with both indoor and outdoor seating. This option should be very popular on the ship's Caribbean itineraries. Garden Cafe is located aft on deck 15 and is the Norwegian Getaway's action station casual restaurant. This dining venue serves three meals a day and has several cruise favorites like omelets made-to-order, a carving station, an Italian pasta station, grilled specialties, and ethnic and international dishes. O'Sheehan's is open 24 hours per day for those looking for classic American favorites and comfort food on the ship. Also a sports bar, this grill has a giant, two-story video screen, terrific for watching sports or movies. The bar and grill has pub games like miniature bowling, pool, air hockey, and interactive arcade games, a well. Savor is one of three main complimentary dining venues on the Norwegian Getaway, along with Taste and the Tropicana Room. Savor is found in the ship's atrium on deck 6 aft and seats 252 guests. It's across the atrium from Taste and features traditional cruise fare with a contemporary twist. Taste is located aft on deck 6 and seats 270 guests. It's one of three main traditional restaurants on the Norwegian Getaway, along with Savor and the Tropicana Room. The Studio Lounge is an exclusive place for solo travelers who are staying in the Studio staterooms. It's perfect for getting together before dinner and gives singles a great place to meet other solo travelers. The Studio Lounge doesn't serve meals...just light bites. Do you need your specialty coffee every day? If so, head to the atrium on deck mid ship and enjoy a la carte premium coffees or teas, along with pastries and cookies. Cagney's is a traditional steakhouse serving choice cuts of Certified Angus Beef cooked to order, along with chicken and fish. Outdoor seating is available at this specialty restaurant. Located on The Waterfront of the Norwegian Getaway, Dolce Gelato is a great place to get a cold gelato on a hot day. After paying for the gelato, guests can stroll along the outdoor deck while enjoying the icy treat. La Cucina is another of the Norwegian Getaway's dining venues that has both indoor or outdoor seating. The Italian menu and decor celebrate the Tuscan countryside. La Cucina is found on deck mid ship. Le Bistro is a Norwegian Cruise Line favorite, and for excellent reason. This signature restaurant serves classic French cuisine and Mediterranean dishes. One interesting twist is Le Bistro's location on deck mid ship in the 678 Ocean Place social hub of the Norwegian Getaway. Many guests will enjoy the al fresco seating option, which provides great views of the three-story chandelier, "sidewalk," and the constant flow of people. Moderno is a Brazilian-style steakhouse on deck 8 aft of the Norwegian Getaway. This is another restaurant with both indoor and outdoor dining. The meal starts with a giant salad bar, followed by a selection of grilled and slow-roasted meats, served and carved tableside by passadors. Ocean Blue is the Norwegian Getaway's premium seafood restaurant. The concept was designed by celebrity chef and Food Network star Geoffrey Zakarian. 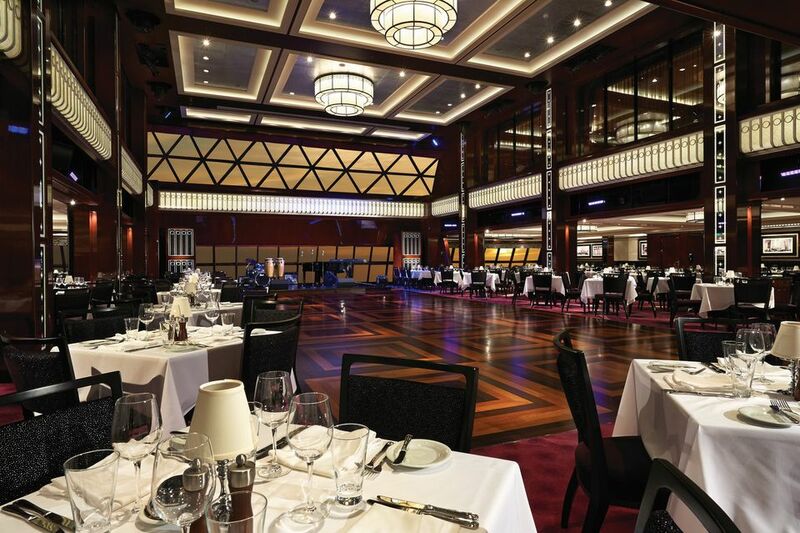 The restaurant is located deck 8 mid ship and is one of the ship's most expensive specialty restaurants. Do you love dim sum or noodle dishes? If so, head to Shanghai's Noodle Bar on the Norwegian Getaway. Guests sit at the counter, have great views of the open kitchen, and nibble on Chinese food. The Raw Bar is appropriately adjacent to Ocean Blue by Geoffrey Zakarian on deck 8 mid ship. What's not to love? Crustaceans and wines by the glass. Those who love Japanese-style hibachi restaurants will love Teppanyaki on the Norwegian Getaway. It's fun to sit at the grill and watch the chefs perform. The food is great, too. Japanese cuisine fans will relish sitting at the bar at Wasabi, the sushi bar on the Norwegian Getaway. The bar seats 44 and serves sushi, sashimi, and artfully-prepared rolls. The 630-seat Tropicana Room is the Norwegian Getaway's largest dining venue. Its retro, glitzy decor includes photos of Miami Beach from the 1950s, a large dance floor, and huge windows overlooking the sea. This supper club also features a great floor show each evening performed by dancers from the "Burn the Floor" show. The menu in the Tropicana Room is similar to those seen in the main dining room of other larger cruise ships, with many selections and a nice variety.